On April 1oth/11th, 2017 there will be a Full Moon in the cardinal air sign of Libra, bringing an exclamation mark to the themes of balance and harmony in your life. A Full Moon occurs when the waxing Moon finally reaches a perfect opposition with the Sun, creating a dynamic tension between the polarities of solar/lunar; rational/intuitive; masculine/feminine. The ultimate purpose of a Libra Full Moon is to bring dissonance into harmony. But like tuning a piano, many minute adjustments to the tensions of the strings will have to be made. The axis of Aries/Libra traverses the divide between self and other, between war and peace. This particular Full Moon in Libra is going to bring quite a lot of emotional struggle, only magnified by the fact that Libra’s ruler Venus is still retrograde and in a square with Saturn. The Moon will conjoin retrograde Jupiter in Libra, which would normally be very beneficial, but this occurs just as the Sun is applying to conjoin Uranus in Aries triggering a volatile T-square between Jupiter, Uranus, and Pluto. The Moon in Libra conjunct Jupiter will summon a magnified desire to keep the peace by pleasing others. However with the Sun in Aries conjunct Uranus and square Pluto, peace will be obliterated by war. The opposition between this Moon and the Sun/Uranus conjunction bespeaks of a great internal conflict, where the moral necessity of non-conformity will be made very clear. Meanwhile, on the other side of the scale, the social benefits of conformity will seem all the more tempting. You may be at a crossroads in life where a decision will have to be made based on a complex array of factors. Your great desire to be free from an ideology will cross swords with the urge to maintain your status through well-forged relationships and alliances. With Pluto’s dark gaze overseeing all this conflict, it will be easy to fall victim to compulsive behavior. With your will divided between iconoclastic Sun/Uranus and acquiescent Moon/Jupiter, you may lack the fortitude to avoid being manipulated. Prepare now to be strong enough to avoid this dilemma by refusing to give in to gossip, excessive intoxication and the alarm bells of propaganda. If you can respond to the pressures of this Full Moon in Libra by determining to strengthen your integrity, you will transmute all this chaos into astounding grace. 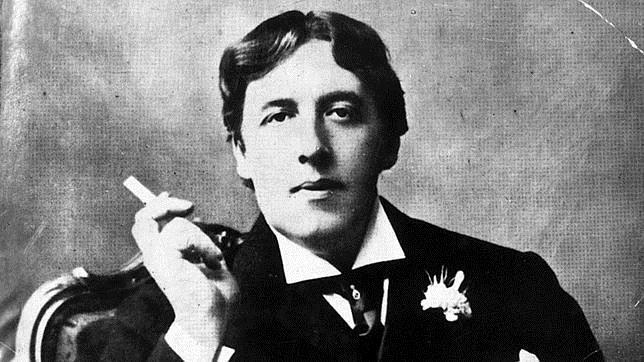 For some divine inspiration regarding how you might behave with such grace during times such as these, let’s take a long look at the figure of Oscar Wilde. Oscar Wilde was certainly one of these diamonds. His writing succeeded the Romantics by only a few decades, but industrialization had increased so tremendously by the late 19th century that Romantic art and poetry were already relics from a bygone era. But Wilde was smitten with the Romantics, writing extraordinary epitaphs for Keats and Shelley and dedicating an entire collection of poems to Keats in which, Hélas, was the prelude. The Victorians, like Oscar Wilde, were standing upon a cenotaph of Romanticism, left to describe a world where nature and all of its soothing rhythms were being consumed at an exponential rate by industrialization. The Romantics had left a great legacy of philosophy and art, but the political moods of the Victorian era were so crushing that the lives and reputations of great poets like Lord Byron, Percy Shelley and John Keats had continued to fall into disrepute. Decades after their deaths, they were continuously defamed for their aberrant lifestyles. The opposing forces and excessive pressures of the Victorian era erupted into Wilde’s first published work, Poems (1881). This is a good example of how Plutonian forces can summon a wave of intense creativity from within the depths of great pain. Despite his rakish public persona, Hélas! is not a glittering song for a liberation movement. Wilde chose to be more subtle, working with the austerity of the Victorian-era which had sought to tame so much of the wild Romantic impulse. Hélas! is a sincere Libran exercise of diplomacy, considering a moral conflict carefully while subtely insinuating the immense power of the Romantic spirit. Like the Moon shadowed by Pluto, Wilde’s genuine feelings are hidden in plain sight. In Hélas, he does not cry out across time to the ghosts of Coleridge and Keats. Instead, he silently nods to them. In this first passage, Wilde softly evokes the memory of Coleridge’s Aeolian Harp, an enduring symbol of the soul’s freedom to be inspired by all beauty! Explicitly, Hélas deliberates upon the immorality of submitting to passion, but implicitly it reminds the reader of the incomparable sublimity of the lute on which all winds can play. Hélas was written as a Petrarchan sonnet: a traditional lyrical form. Yet Wilde states that his life is like a “twice-written scroll” whose original words have been freely “scrawled over” by the whims of passion, where the spirit of poetry and songs have disrupted the societal prescriptions he was first given. Thus, he is implying that though his form may represent one ideology, there is another layer of meaning written on top of it. At this Full Moon in Libra, it is important to contemplate this theme in your own life. Where have you conformed to your society’s script and where have you made revisions? If you suffer from guilt or shame for having gone off script, then know that you are not alone. Likewise, if you have too long conformed to the script, do not despair. This Full Moon in Libra is oriented towards helping you to embrace your life choices, finding beauty and harmony in the lessons you have learned. Wilde ends Hélas! on a somewhat ominous note with a philosophical/theological question for his readers to ponder. He is revealing the petulant and conformist attitude of his time which condemned so much of what is simply natural to human beings. It is this punctuation of bleakness that makes Hélas! so starkly Victorian. It would be nice to sigh in relief, knowing that the 21st Century is nothing like the Victorian era…that we have progressed. But this of course is not really the case. What is natural to humans is still condemned. The Earth is still being mined, drilled and exploited without regard. Poverty is still enforced and war is endless. Thanks to information overload, any inner conflict you experience is now reflected in such a multitude of external conflicts that hysterical grief and numbness are inevitable. And in a society without privacy, where the worth of a citizen is forever measured by grades, records and scores, visions of Hell seem quaint by comparison. Think of this Full Moon in Libra as a chance to get out from underneath the heaviness of your social conditioning by pushing just a little bit past your limits. Knowing that you can handle great conflict with poise and grace will empower you to release the unbalancing weight of guilt and shame. The benevolent message of the Full Moon in Libra is that peace and harmony are your soul’s inheritance. And your soul’s work is to remember that no matter what the external conditions of life may be, you always have the power to transform evil into benevolence, fear into courage and hatred into love.